I was down in Sydney for the long weekend visiting family and friends. It was very nice time to catchup with a few sisters and the obligatory lounge room tanninzygake err… Rumble with nieces and nephews too. Whilst out for a stroll I spied a beautiful dojo set in the rural environs of Terry Hills. Imagine my surprise to find an aikido seminar underway and none other than Bill Gleason Sensei – who I visited 2 years ago in Boston, leading the instruction. At the half time oranges err… mandarin break I had the good fortune to catch up with what is possibly the broadest cross section of the Australian Aikido community gathered in a single place, well done to Balmain dojo and Seymour Sensei!. Gleason Sensei, of the Yamaguchi lineage was putting the Aiki back into aikido in what was less about technique and more about the feeling. That is about building Aiki from within rather than through technique. It was for me the next step in following the internal strength movement in aikido circles ( see). Bill sensei speaks highly of Dan Hardens method and brings a translation of it to the aiki arts. I was also reminded of some of the teaching of my former school such as a) Kotai, Jutai and Ryutai levels of practice and the importance and b) insights that can come from the Kashima sword school, really liked the neutral /support points being exlored through the sword. Thursday night we had our dojos last Aikido Yuishinkai class. It was a nice time to examine and reminise our journey with the school and all that it had taught us, domo arigato gozai mashita! Whilst our dojo is only comparatively new, we had the pleasure of hosting Will Reed last year to help us see under the hood a little of what makes Aikido Yuishinkai tick. 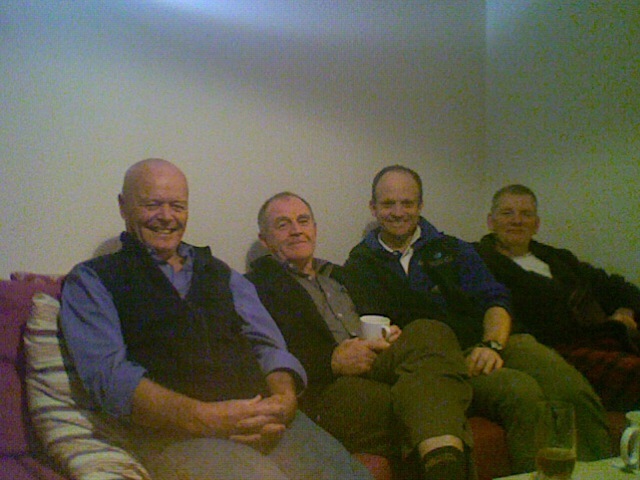 Prior to these several, who had of us opened dojo and hosted several national and international seminars too. The school’s syllabus is a fantastic progressive transition from static to movement to high level practice as one progresses in the art. The influences of the internal practices of the Daito-Ryu and several weapons schools help bring alive the kata too. The schools doka of positive mind and ‘aikido without boundaries‘ have been inspirational. Where to from here? We really like the founders Doka and enjoy a swim or two. To our Aikido Yuishinkai friends near and far, its been a fun ride, sadly our journey lies elsewhere. We look forward to sharing the path and grabbing wrists again in the near future and the serendipity of visitors on doorsteps. T he dojo was unexpectedly closed this weekend (our TKD/HKD brethren we share the space with had a 40hr training marathon for charity), so with a car load of Hakamai (plural of hakama) we headed to the North coast of NSW early Saturday morning to catch up with Aiki-friends. 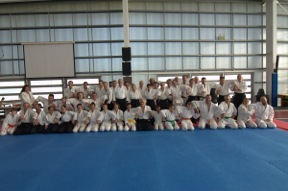 The occasion, a residential seminar by Williams Sensei, that we managed to sneak into. A few Nikyo later and lunch courtesy of the NSWIS Northern Beaches High Performance Centre (always good to eat like an athlete) we headed back home. Below is a review of when we had the boys up from Sydney a few years back. “In 2008 I had the privilege of attending one of Mike’s seminars at Andrew Sunters Sydney dojo and to host him in Brisbane for a weekend seminar later. Mike has been training martial arts for not-quite 30 years and is a recognized instructor in Kempo, Aikido and Yang Mian. In real life he is also a practicing physiotherapist. Recently he has been studying a system called target focus training, which he regards as ‘the pointy end of the stick’ for personal protection. I believe it embodies many aikido principles, but with the gloves off. Mike sensei is an approachable and articulate instructor with a genuine interest in sharing this method in a safe environment. 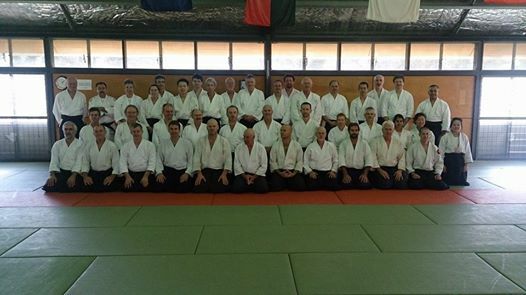 A big thankyou to Steve Seymour Sensei from Aikido Kenkyukai and Balmain dojo for his visit on the weekend. We were treated to a tour de force of Internal Strength as sensei shared from his current practice and further research into Internal Strength. Its almost a year since we visited Seymour Sensei in Sydney to find out a bit more and embarked on the journey with our own study group. Internal strength allows us to see what is hidden in plain sight in our schools kata and exercises given to us by Okajima and Maruyama Sensei’s. Unfamiliar and familiar teachings (like keeping elbows in and closing and seperating the shoulders and hips) were given context, purpose and a framework. It was great to see Dave Kolb Sensei from Bayside Budokai and Kim from Brisbane Aikikai too. We appreciated much also his insights in how to continue this practice in an integrated way with the aikido arts and to know we are (more or less) on the path.